I had been saving Letters for my February singles round up, after they gave away a two-track single for free in the middle of the month. But I don't really count that as a single, more two free downloads (embedded below), so they get an extended feature here instead. 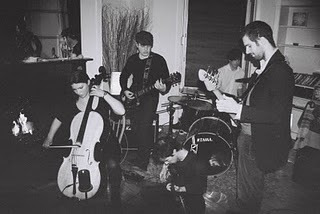 I've heard the band are building up a head of steam in their native Scotland, sporting a style of music they consider "dark cello pop-noise". In terms of comparisons to other bands, these ears think they sound a bit like an enthralling mix of Frightened Rabbit and Idlewild. It's still very early days though, and the band only played their first gig a couple of weeks back. Let's hope they don't let the team down from here on. So far, Letters, I give you an A.